BLOOMINGTON, IN; October 27, 2014—A new study by researchers at The Kinsey Institute and the Fred Hutchinson Cancer Research Center has found that the timeless, multicultural tradition of grandmothering might have an unexpected benefit: helping some women temper their hot flashes and night sweats during menopause. The researchers, two clinicians and a bioanthropologist, examined how close relationships can help women in midlife with this inevitable change—with the clinicians looking for therapeutic benefits that might help patients deal with this unpredictable, poorly understood transition, and the bioanthropologist predicting an evolutionary connection. Their study, which focused on the relationship between mid-life women and young children, found that women who underwent rapid menopause, caused by the surgical removal of ovaries, had fewer hot flashes and night sweats when young children lived in their homes. October 2, 2014—Grandparents can significantly influence parents' decisions to have additional children and the well-being of grandchildren, according to a recent study completed at the University of Eastern Finland. May 12, 2014—Teenagers and their foster families often say they don't feel connected and have trouble communicating, but few resources exist that nurture their bonding. In a research paper being published in the June issue of Children and Youth Services Review, researchers affiliated with the University of Washington's School of Social Work describe how they tailored a parenting program known to improve communication in non-foster families for use in foster families. 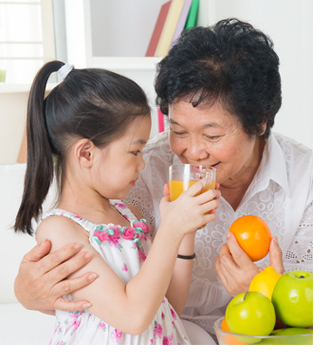 April 4, 2014—Does living with grandparents ease or worsen a mother's baby blues? The answer may depend on the mother's marital status, a new study from Duke University suggests. August 21, 2013—Grandmothers who care for their grandkids fulltime need help for depression and family strains, report researchers from the Case Western Reserve University’s Frances Payne Bolton School of Nursing. When we choose to hitch our star to the wagon of our dreams, we aren't always prepared for all the cargo in the back. In fact, sometimes it's hard to tell exactly how much cargo the wagon actually carries. How close is your new partner to his or her family members? How close will you be expected to be? Will the two of you interact mostly with his nuclear family, or will you be expected to spend significant time and effort on relationships with in-law aunts, uncles, cousins and grandparents too? The answers to these questions will vary considerably depending on the situation, but for all of us, the potential exists for unwelcome surprises. Ruth Nemzoff to the rescue! In her latest book, Don't Roll Your Eyes: Making In-Laws into Family, this resident scholar from Brandeis University shows us how to navigate these unique relationships and smooth the way to making in-laws a gift rather than a curse. Bella DePaulo is a visiting professor at the University of California–Santa Barbara. As a social scientist, she has focused on friendship and single life as well as on interpersonal deception. Among her published books are three related to the role of singles in society, including Singled Out: How Singles Are Stereotyped, Stigmatized, and Ignored, and Still Live Happily Ever After. Robert M. Milardo is a professor of family relations at the University of Maine, whose research focus includes family relationships, marital relationships, kinship, friendship, and aunts and uncles. The latter is the topic of his latest book, The Forgotten Kin: Aunts and Uncles. Grand Cultures: How Important Is Grandparenting? According to Candace Kemp, a professor at Georgia State University’s Gerontology Institute, grand cultures are “patterns of relating between grandparents and grandchildren within families across and within generations.” These patterns of interaction are often passed down, because each generation absorbs the example that came before and develops expectations of how they will behave (or how they will not behave) when it’s their turn to grandparent. Understandably, some families have positive grand cultures and others have negative ones. But as Kemp found in her 2007 study of grandparent-grandchild ties, social changes over the last century have dramatically changed relationships to the point that many families have no particular grand culture at all. In fact, this was true of fully half of the families she examined. How important is grandparenting, and how can families maintain grandparent-grandchild ties across the miles?